“Do you believe AI has a place in early childhood education?” facilitator Tim Leberecht asked the assembled group. The vast majority moved to the side of the room marked with a “Yes” sign. Two people moved to the opposite wall and stood under the “No” sign. The rest clustered in the middle, in the “Ambivalent” zone. “Are you afraid of AI?” he continued. “Last question: Are you optimistic about the future?” Now almost everyone stood on the “Yes” side. Behind them, the lights of the Chicago skyline glimmered, and the black expanse of Lake Michigan stretched beyond, its horizon melding seamlessly into the night sky. “If you’re not optimistic about the future, you shouldn’t be in early childhood. It’s the most optimistic job there is,” one woman remarked to her neighbor. She has something there: Early childhood education (ECE) is all about a person teaching little persons what it means to be a person in a big society full of complex other persons. 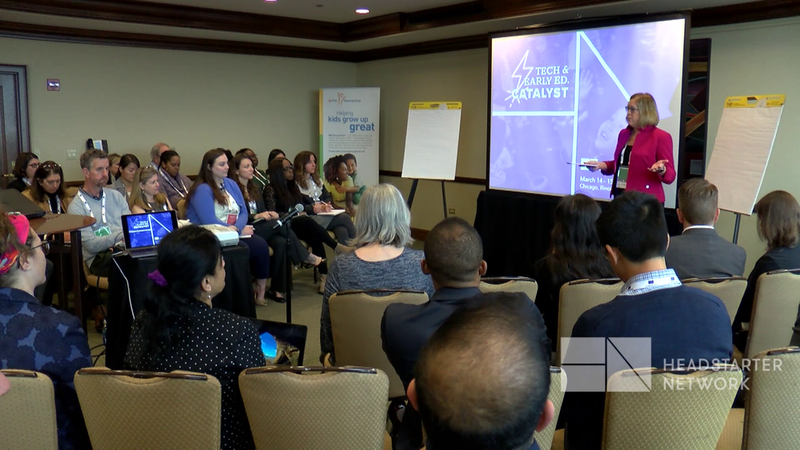 And here, at the first Headstarter Network (HSN) “Catalyst” gathering, 50 thought leaders in neuroscience, AI, and early childhood development, as well as entrepreneurs, technology developers, and philanthropic investors listened, brainstormed, and developed plans they hoped could help guide the integration of AI into the lives of children, and the children into the future. Children’s brain development is unique. Between birth and the age of five, neuroscientist Jamie Roitman told the group, the brain is highly plastic, and can take in vast amounts of sensory input. It’s also highly vulnerable to trauma and to the lack of a sensory-enriched environment, the effects of which become locked in, affecting many aspects of later life. Roitman walked the Catalyst audience through 70 years of neuroscience research that began with a study of seven generations of rats in the 1950s. Donald Hebb used rats and mazes to first demonstrate that an enriched environment creates an equal opportunity for the young regardless of their family backgrounds. His research was fundamental to the launch of the federal Head Start program , which now has decades of experience—and over 35 million alumni—demonstrating that enriched early childhood education creates a level playing field for the nation’s children. In fact, according to University of Chicago Nobel economist James Heckman, children who experience rich early childhood education have a distinct advantage. He is staking his reputation and investing his professional energies in broadcasting the “13% ROI” (return on investment) achieved by high-quality birth-to-five programs—a higher rate of return than preschool alone. Heckman notes that it’s early social-emotional skills, not cognitive learning, that have a lasting effect and boost a person’s chances at success in life. Quality birth-to-five programs, Heckman has found, even have long-term implications for lifelong health. Heckman’s colleague, UChicago pediatric surgeon Dana Suskind, has launched a nonprofit to support early learning based on the fact that young children need to hear other humans speak 30 million words in order to fully develop their brains. Dave and Helen Edwards offered a brief history of artificial intelligence to the audience, and an overview of its capabilities. They focused on three pivotal points: the development of the PC, of the search window, and of the “collective intelligence” now possible through the data collected from smart apps, Facebook, and Alexas around the world. The pair worked their way through AI’s capacity to “think, see, hear, feel, move, and learn—and then keep learning.” Big Tech, they pointed out, has moved from computation, to modeling, to measuring itself, to improving itself. It’s also moved from human-taught, to human-supervised learning, to unsupervised learning, to machines learning from experience. AI’s abilities to feel and to keep learning, as well as its capacities for unsupervised learning and for learning from experience, are why the possibilities are both exciting and, as one participant put it, “creepy.” The capacity of AI to learn from the patterns found in large quantities of data is already far beyond the capabilities of the human mind. The opportunities for human-machine collaboration arise from three areas: “personalization,” augmented reality, and avatars. Each is ripe with possibility—and also danger. Early childhood brain development, Roitman noted, is remarkable in two ways: the brevity of its window, and its plasticity and vulnerability. These she illustrated with MRI scans, finally concluding with “Neurons that fire together, wire together,” building the elements of efficient, effective brain function. It is a complex process that Roitman calls the “locking in” of human experience into brain development, and which will serve the brain (or not, depending on what’s missing) for the rest of the person’s life. It isn’t until the early 20s that the prefrontal cortex of the brain develops the capacity for critical judgment and emotional regulation. Nicole Harlaar and Avery Desrosiers from IBM Watson Health’s Maternal and Child Health section, an event partner, gave the group an overview of current trends in AI among parents with young children. These ranged from a monitor that tracks a sleeping infant’s heartbeat and breathing, to an app that uses a game to prompt a young child through the steps of getting ready for school in the morning. The presentation cited some new findings in the U.K. around higher small motor skills and lower large motor skills in toddlers with screen time, compared to those without screen time. The IBM Watson white paper presented at the meeting was aligned with the “self-deliverables” the working groups will develop, and those deliverables will help shape the paper’s final form. It was a fitting end to this meeting that one AI researcher termed ECE as the “superfuture” human profession—a profession which no machine can do.